In this article, we’ll discuss what age-related macular degeneration (AMD) is, what the common symptoms are, how it can be treated and the ways it can be controlled. We’ll also explore some frequently asked questions about the condition. AMD is the leading cause of vision loss in people aged 60 and over. Even though it’s a painless condition, it will often affect both eyes, with sufferers losing their central vision. This means, when they’re looking straight ahead, their vision is blurred, colours are less vibrant, reading is difficult and people’s faces become unrecognisable. This loss of sight generally happens over a period of time, but some may find their eyesight deteriorates quickly. However, because AMD doesn’t affect the peripheral vision (side vision), complete blindness isn’t caused by this eye condition. 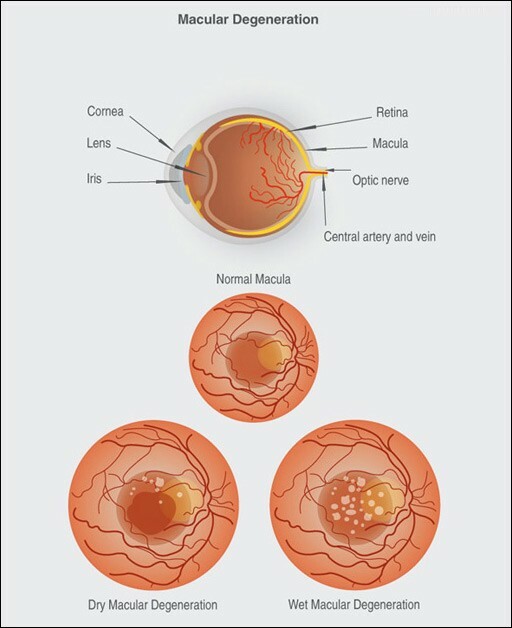 Around 9 out of 10 cases of AMD are dry AMD, and this occurs when a buildup of deposits (drusen) damage cells in the macula. Compared to wet AMD, this is the least serious, because vision loss will happen gradually over a number of years. However, a tenth of all people who have dry AMD will go on to develop wet AMD. Often referred to as neovascular AMD, wet AMD develops when cells are damaged underneath the macula due to the growth of abnormal blood vessels. This is more serious than dry AMD, and without treatment, your vision can deteriorate rapidly within a few days. Even though it’s clear AMD develops as you get older, the exact cause of this eye condition still remains a mystery. Age-related macular degeneration occurs due to problems that arise in the macula, which is located in the centre of your retina. Providing sharp, central vision, the macula is constructed of millions of cells that are sensitive to the light. Therefore, when rays of light coming into your eye are focused here, it allows you to see things that are straight in front of you. The macula plays an important role in detailed, close-up activities, such as writing and reading. The light-sensitive cells of your macula can start to deteriorate as you get older. That’s why dry AMD normally develops over a number of years, as this deterioration will be gradual. Within your retina, waste products may also start to gather, which form small deposits, also known as drusen. For dry AMD sufferers, drusen is a common problem, and, as the condition progresses, these waste particles tend to grow in size. During the latter stages of dry AMD, your macula will have fewer light-sensitive cells, which is why you’ll notice a deterioration in your central vision. Often, you’ll find a blurred spot in the middle of your eye, which means your vision loses its definition. This means you may need more light when you’re carrying out close-up activities. In wet AMD cases, the macula is also affected, but this time it’s by tiny blood vessels that start to grow underneath it. Doctors believe these vessels start to form in a bid to clear away the waste (drusen) that’s accumulated on the retina. However, these blood vessels aren’t growing in the right place, which is why they cause more harm than good. They can leak fluid and blood into your eye, which can damage your macula and cause scarring. And it’s this that results in the more serious side-effects of wet AMD, including blind spots and distorted vision. What Increases Your Risk of Developing Age-Related Macular Degeneration? The older you are, the more likely you are to develop AMD at some level. The majority of cases begin when someone’s aged 50+ with 1 in 10 having some signs of the condition by the time they’re over 65. AMD has been found in certain families. Therefore, if your sisters, brothers or parents develop AMD, you’re at a greater risk of developing it, too. This indicates that your increased risk of suffering from AMD is down to genes that have been passed on by your parents. However, it’s still unclear which genes are to blame and how these are passed through the generations. When you smoke, you’re four times more likely to develop age-related macular degeneration than someone who doesn’t and never has. Your risk of developing AMD increases the longer you’ve been smoking for, and your risk is even higher if there’s a history of AMD in your family and you smoke. Some studies have found that white and Chinese people are at the highest risk of developing AMD, with black people being at a lower risk. It is thought this could be due to genetics. Developing early AMD could be increased if you’re drinking over four units of alcohol every day. Your risk of developing AMD may be increased if, during your lifetime, you’re exposed to a lot of sunlight. To protect yourself, you should wear sunglasses that have UV protection, especially when you’re spending a long period of time in the sun. Your chance of developing age-related macular degeneration may be increased if you’re obese and have a score of 30 or more on the body mass index (BMI). Some evidence does suggest that a history of coronary heart disease or high blood pressure may increase your chances of developing AMD. Due to the fact AMD isn’t a painful condition, you might not notice you’re suffering from it until you experience some loss of vision. Finding your central vision has become blurred is the main symptom of AMD, which means you’ve lost visual acuity and are unable to see the finer details. This makes driving and reading difficult. You’ll also lose contrast sensitivity, which affects your ability to distinguish things from a background, e.g. faces. You may also find that what you’re looking at becomes distorted in the centre – this is a symptom that’s more commonly associated with wet AMD. You won’t notice a difference with your peripheral vision (side vision), and your blurred central vision cannot be corrected with glasses. Even though it’s common for both of your eyes to be affected, you may start to notice AMD in one of your eyes first. When you suffer from dry AMD, it can take up to 5 or 10 years for your daily life to become affected by your loss of vision. Sometimes, if you have a healthy eye, this will compensate for your affected eye, removing much of the vision loss or blurring. If this is the case, you might not notice the symptoms as quickly. If any of these symptoms apply to you, you should make an appointment with your local optometrist or GP as soon as possible. In a lot of cases, you’ll only develop wet AMD if you had dry AMD in the first place. However, if you have developed wet AMD you may notice that your central vision is getting worse. If you notice any of these symptoms, you should book an emergency appointment with your optometrist. If left untreated, wet AMD can severely affect your vision. Sometimes, when AMD is in its early stages, it can be detected when you’re having an eye test, and this will normally be before you’ve noticed any of the symptoms yourself. If it’s suspected that you have AMD, you’ll be referred to a doctor who specialises in treating eye conditions – an ophthalmologist. This appointment will often take place in the eye department of a hospital. If you do need to drive to this, it’s advisable to take someone with you as the eye drops used in the tests may make your vision blurry. To check for AMD, the ophthalmologist will perform an examination of your eye. To do this, they’ll need to enlarge your pupils which will involve giving you eye drops. It normally takes up to 30 minutes for these to start working, and when they do, you may notice your eyes are more sensitive to light and your vision’s become blurry. However, after a few hours, this will wear off. The ophthalmologist will look at the back of your eyes using a magnifying device, which has a light attached to it. This will allow them to look at your retina and macula, checking for any abnormalities. If they believe you’ve got AMD, they’ll carry out some more tests to confirm their diagnosis. The Amsler grid is one of the first tests they’ll conduct, which involves looking at a special grid that’s made up of horizontal and vertical lines and a dot in the centre. If you have macular degeneration, you’ll probably find that some of the lines are distorted, broken or look faded. By telling the ophthalmologist which lines are broken or distorted, it’ll give them a better idea of how damaged your macula is. Because the centre of your vision is controlled by the macula, it’s often the lines towards the centre that appear broken or distorted. It’s even possible to do this test at home thanks to the Amsler grid that’s been produced by the Eyecare Trust. In order to find out what damage, if any, has been caused by macular degeneration, part of the examination will involve photographing your retinas. Using a special camera (a fundus camera), the inside of your eye is photographed, and 3D images of your macula are captured. This enables the ophthalmologist to establish whether any damage has occurred to your retina. This examination produces detailed images of the blood vessels in your eye and the blood flow within them. To create these images, your blood vessels are injected with a special dye, which will highlight any abnormalities within them. This procedure can identify the type of AMD you have, and if wet AMD is suspected, your ophthalmologist may carry out this test. If some of the dye is leaking from the vessels that have built up behind your macula, this may indicate wet AMD. This follows a similar procedure to the above but uses a different dye which can highlight slightly different issues within your eyes. To produce an image of your retina, this procedure scans your retina by using special rays of light. This can provide your ophthalmologist with details about your macula, such as whether any fluid has leaked through into the retina, or whether your macula is abnormal or thickened. After the tests have been completed, you should receive a diagnosis of how progressed your AMD is. At this stage, you might not have any noticeable symptoms. However, inside your eye, there may be some minor damage to the retina, along with small collections of deposits (drusen) and perhaps a few medium-sized deposits. If your AMD has advanced to this stage, larger collections of drusen may be inside your eye, or the outer part of your macula may have some tissue damage. You’ll probably also notice that, in the centre of your vision, there’s a blurred spot. Now, in the centre of your vision, you may have a large blurred spot, which makes it difficult for you to recognise faces and read. This is because damage has been caused to the centre of your macula. In cases of wet AMD, this is always treated as an advanced form of age-related macular degeneration. Unfortunately, there is no cure for dry types of AMD at present although some evidence that vitamins may help. For wet AMD, Laser therapy (different to the laser eye surgery we mainly cover on this site ) can be used as well as anti-vascular endothelial growth factor (anti-VEGF) drugs which are injected. Your vision may deteriorate very slowly when you have dry AMD, and you won’t suffer complete blindness as your peripheral vision (side vision) shouldn’t be affected. Therefore, to make it easier for you to carry out day-to-day tasks, practical help may be beneficial, including large-print books, magnifying lenses, screen-reading software (which helps you use your computer) and very bright reading lights. To provide you with this support, you may be referred to a clinic that specialises in low vision cases. Some evidence suggests that a diet high in lutein, zeaxanthin, and vitamins A, C and E may slow down how quickly dry AMD progresses – and it may also reduce your risk of developing wet AMD. (Your ophthalmologist should be able to advise whether these will be beneficial to you). Foods that are rich in vitamins A, C and E include carrots, tomatoes, leafy green vegetables, kiwis and oranges. Leafy green veggies, as well as sweetcorn, mangoes and peas are also a great source of lutein. Even though there’s no solid proof that these foods are an effective treatment for dry AMD, the benefits they offer your overall health are good, too. Vascular endothelial growth factor (VEGF) is one of the chemicals responsible for new blood vessels growing in your eye, which is caused by this condition. To block this chemical, anti-VEGF drugs can be used, which will prevent these blood vessels from being produced, helping to stop your wet AMD from getting worse. A very fine needle is used to inject this medication into your eye, and you will be administered with local anaesthetic eye drops before so it doesn’t hurt. A lot of people will find this procedure has minimal discomfort and can be tolerated quite well. Sometimes, the blood vessels in your eye can be shrunk by anti-VEGF medication, which helps to restore some of the vision that’s been lost due to AMD. However, some might not see an improvement and vision cannot be restored completely. This involves injecting verteporfin (a light-sensitive medicine) into your arm. This attaches itself to the abnormal blood vessels that have grown in your macula. A low-powered laser is then used on the affected area, and the light from this activates the drug as it is absorbed by the verteporfin. This destroys the abnormal vessels, preventing them from leaking fluid or blood and causing further damage to your eye. Sometimes, this treatment may need carrying out every few months to make sure the new blood vessels that are growing are being controlled. Some cases of wet AMD can be treated with laser photocoagulation, but this is only suitable if the abnormal blood vessels aren’t growing close to the fovea. Surgery in this area of the eye can cause permanent vision loss. Typically, 1 in 7 people are suitable for this operation in which a laser is used to burn away sections of your retina. This causes this area to harden, preventing any abnormal blood vessels from moving further along the macula.